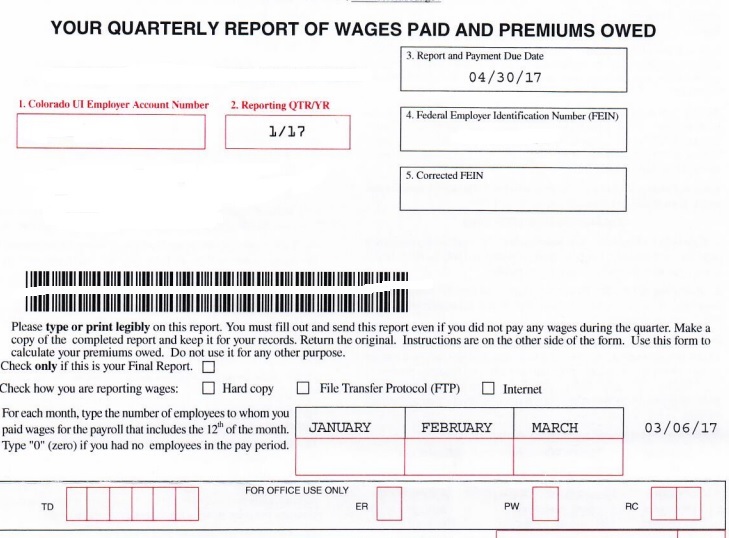 Did you receive a "red copy" or blank Colorado Unemployment quarterly form in the mail? This will arrive in the mail at the end of the months of March, June, September and December. It is used to report your employee wages which are subject to Colorado Unemployment Insurance taxes. ASAP Accounting & Payroll, Inc. files this tax return for all payroll service customers each quarter. No action is required on your part with two exceptions: Is the address shown accurate still for your business? Does the return show a credit or debit amount due? Address: Is your company name & address still accurate? If not, you can update your address/name on file with the Department of Labor. Credit/Debit Amounts: Is there a credit or amount due in box 15? If so, please send to ASAP via fax 970-728-6848, email or upload here. We will contact the state/review and get back to you with next steps. UI credits/debits can happen for various reasons. The only way to get an over-payment or credit back from the state is to offset a future UI payment. If you have a credit, ASAP can apply it against your next liability payment and return the money to you. If there is a debit amount shown, it is a sign that either a UI rate for the current or prior year was inaccurate or that other premiums are due possibly from an outside UI audit. ASAP completes the UITR return as a bulk filer and transmits the wage data securely via Colorado FTP procedures. Copies of the returns are shared with you via the Client Portal. If you have any questions about the form, please let us know. Please do not complete this form or have your bookkeeper or CPA file it with the state as it may conflict with the wages and filings ASAP submits on your behalf.